This is the statement of Dr. Nona Legaspi during the turnover of their donation to Bantay Kalikasan of ABS-CBN Lingkod Kapamilya Foundation. She is the Class Coordinator of high school graduates of Batch 69 of St. Theresa’s College, Manila. 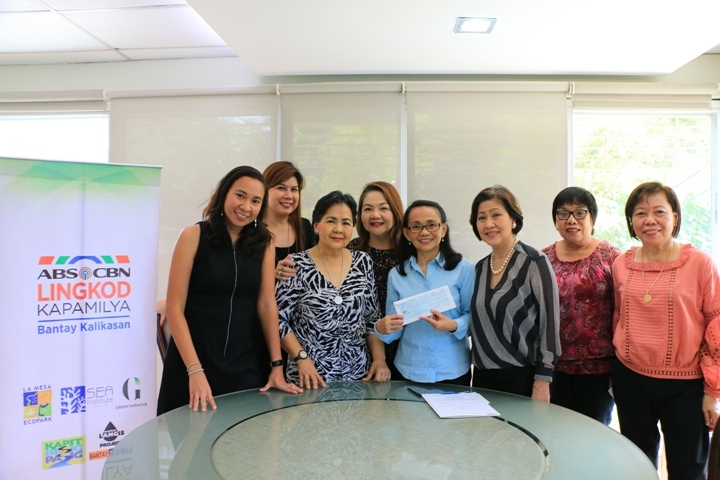 Representatives of High School Batch 69 of St. Theresa’s College, Manila, turn-over their donation to Bantay Kalikasan. The turn-over was headed by Jen Santos, ALKFI-BK’s Program Director; Angelita Lara, ALKFI’s Chief Finance Officer; Josine Reyes, ALKFI’s Donor Management Head; Olive Ang, HS Batch 69 of STC Manila’s Committee Chairperson, and Dr. Nona Legaspi, HS Batch 69 of STC Manila’s Class Coordinator. In preparation for the celebration of their Golden Jubilee, their class members contributed to make a donation to help the Jessmag Aeta Community in Sitio Jessmag, Palanginan, Iba, Zambales. These are families affected by the Pinatubo eruption in 1992. The donations will benefit 160 beneficiaries with grocery packs, and school supplies, reference books, and a wall fan for ADBSA (Asian Development Bank Spouse Association) Aeta Elementary School. ADBSA Aeta ES was also a beneficiary of school supplies from ALKFI-Operation Sagip’s Gusto Kong Mag-aral project back in 2017. Olive Ang, the group’s Committee Chairperson shared that they already have future plans with Bantay Kalikasan. “This is our first year of outreach. We already have a second one and we are projecting that we are going to be ready for the funds in January or February of 2019, to donate Kayaks to Lobo, Batangas.” The kayaks are for the Lagadlarine Marine Eco-tourism Circuit. “We choose those that have sustainable projects and I think BK is big enough for these criteria,” she added. Lobo, Batangas and Iba, Zambales are just two of the 15 areas under the Grassroots Economic and Environmental Initiative (GREEN Initiative) of Bantay Kalikasan. To know more about Bantay Kalikasan, visit www.abs-cbnfoundation.com.